Elsa broke her maiden at first asking at Laurel Park. 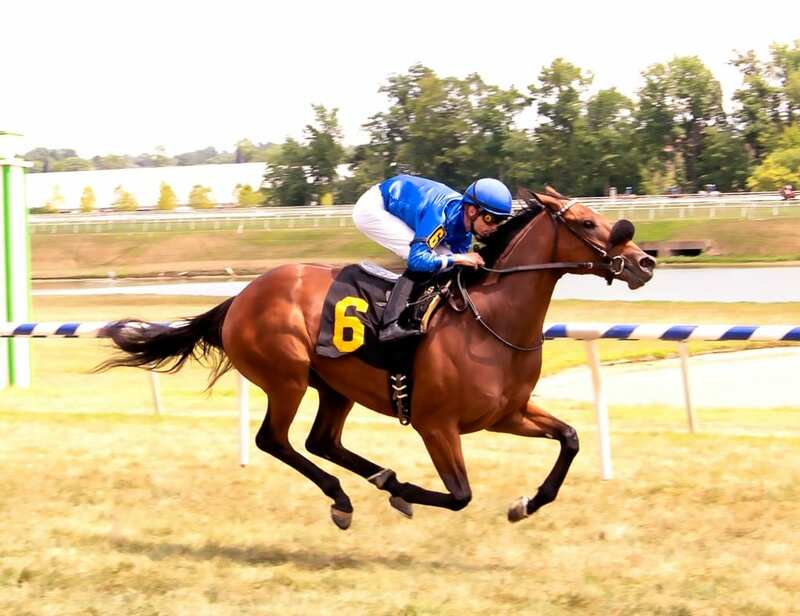 Photo by Jim McCue, Maryland Jockey Club. Godolphin homebred Elsa, a juvenile daughter of 2011 Kentucky Derby (G1) winner Animal Kingdom, made her race debut an impressive one with a 3 ¾-length victory in Friday’s featured third race at Laurel Park. Ridden by Sheldon Russell for trainer Michael Stidham, Elsa ($9) cruised to the wire in 1:02.74 for 5 ½ furlongs over a firm Bowl Game turf course in the $40,000 maiden special weight for 2-year-old fillies. Out of the Distorted Humor mare Abtasaamah, Elsa had been working steadily at the Fair Hill Training Center in Elkton, Md. for her debut, showing seven breezes since late May over the main and all-weather surfaces including four bullet workouts. Second choice in a field of nine at 7-2, Elsa settled in third behind Skyphos and 3-5 favorite Sexyama through a quarter-mile in 22.99 seconds and a half in 46. Russell tipped Elsa out three wide rounding the far turn, wresting the lead from Sexyama in mid-stretch and steadily edging away under a hand ride. Sexyama was a clear second, 3 ¾ lengths ahead of Varenka, who held off late-running Who U Gonna Call by a nose for third. Elsa is one of 25 horses Stidham has for Sheikh Mohammed bin Rashad Al Maktoum’s Godolphin operation, 20 of them 2-year-olds. Elsa was the first juvenile of the group to run for Stidham, who was initially introduced to Sheikh Mohammed after he purchased Stonerside Stable from Bob and Janice McNair. Elsa is likely headed to stakes company for her second start. The next open stakes for juvenile fillies on the grass at Laurel is the $100,000 Selima at six furlongs Saturday, Sept. 15.